Sofitel Angkor Phokeethra Golf & Spa Resort is home to some of Siem Reap’s most recognised and loved restaurants and bars, dishing up a diverse range of cuisine from traditional Khmer classics to luxurious contemporary French fine dining. Dreams become reality at our hotel grounds as we invite you to begin the day with a lavish breakfast buffet, combining fresh ingredients, delicious recipes, and exciting live cooking stations to create an unforgettable dining experience in paradise. Our hotel boasts a selection of all-day dining venues including the poolside Serpent Bar, which is the perfect place to enjoy our wide-range of drinks and refreshments. However, despite the popularity of our many eateries, the colonial inspired Explorer’s Tales bar is definitely the best bar Siem Reap offers. Explorer’s Tales provides the perfect atmosphere and setting for an evening aperitif or post-dinner drink. 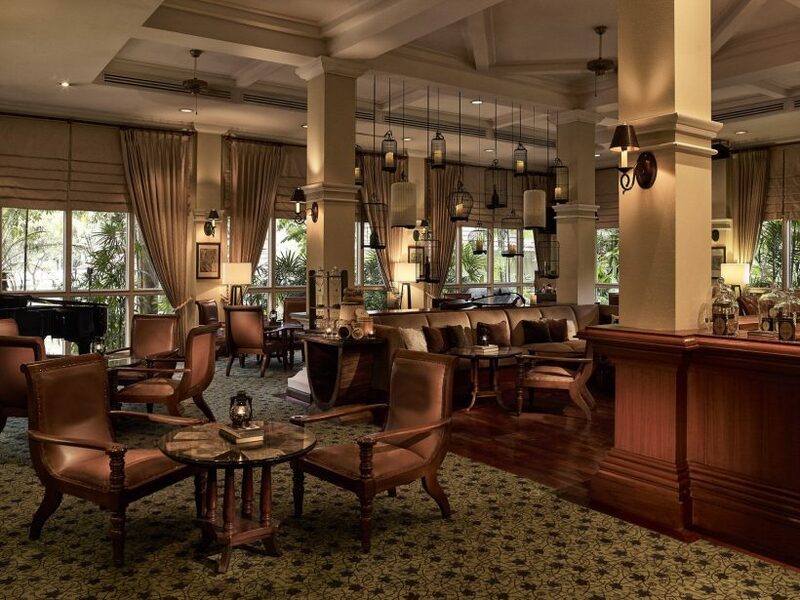 Decorated in dark wood and elegant European elements, the ambience of the bar can transport you back to the colonial era while you sit back, relax and enjoy delicious cocktail concoctions, experiment with exciting local and international spirits, and even puff on a cigar if you prefer it. The bar’s extensive wine list features selections from all corners of the globe with choices to suit everyone, from crisp and light whites to robust and flavourful reds, and everything in-between. A definite reason Explorer’s Tales is considered a top bar Angkor is home to, is the unique and carefully crafted cocktail menu. Taking inspiration from Cambodia and the region’s local flavours, our dedicated team of mixologists have crafted popular drinks such as the Lemongrass Martini and Kaffir Lime Colada. On top of the delicious drink choices, Explorer’s Tales also serves up light bites of Asian and International fare making the bar a top choice for Tapas Siem Reap guests can appreciate. The bar serves salads and finger bites that are a nod to traditional South East Asian flavours such as spring rolls, tangy Khmer fish cakes served with chili sauce, and the zesty green papaya and mango salad. Pizza is always an ideal choice for an evening paired with wine and drinks, and our menu offers both classic European choices such as the Parma ham pizza as well as Asian inspired favourites like the chicken curry pizza with coriander, cumin and chili flakes. Delicious. As the top Tapas Angkor offers, the bar’s menu is decorated with a wide-range of choice. Some of our favourites include the succulent Grilled Pork Belly served with spicy Salsa Verde and crunchy potato chips, the rich Smoked Salmon Tartine on Rye bread with egg and radish cream for a kick, and the crispy Calamari Tempura served with a sharp tamarind sauce. In addition to delicious food, and fantastic drinks, from Tuesday to Saturday, the bar is transformed into a live music venue from 6pm onwards where our talented guitarist will serenade you late into the night with their smooth melodies. So make sure to join us for an evening of canapés, wine and good company at the top bar Siem Reap offers! Magnifique! A perfect venue for events. For both packages, children receive 50% off the buffet. Thank you for your booking, we will contact you shortly to secure your room with a payment. Your unforgettable Valentine’s Day Dinner in the brand-new French Fine-Dining restaurant Mouhot’s Dream! please give us your contact details so that we can book your day pass. Please choose a date for your day pass. Please leave us your contact details in order to get back to you to confirm your booking.